I love doing these. Save your invites and napkins and bits and pieces from the wedding to do. I will incorporate them in a painting for the bride and groom. We can go many ways with this--one of my favorites is a still life with the bridal bouquet in a vase. I paint it first and them go back in with the collage material to make it truly special. I am able to put their names, wedding date and place into the painting. This is a wonderful gift. I provide a card with a small original painting on the front for you to give them on the wedding day and have the finished painting collage in your hands 30 days after I receive your information, picture, and items. The price is $400 for an 11 x 14 which is a size that can be framed by you. 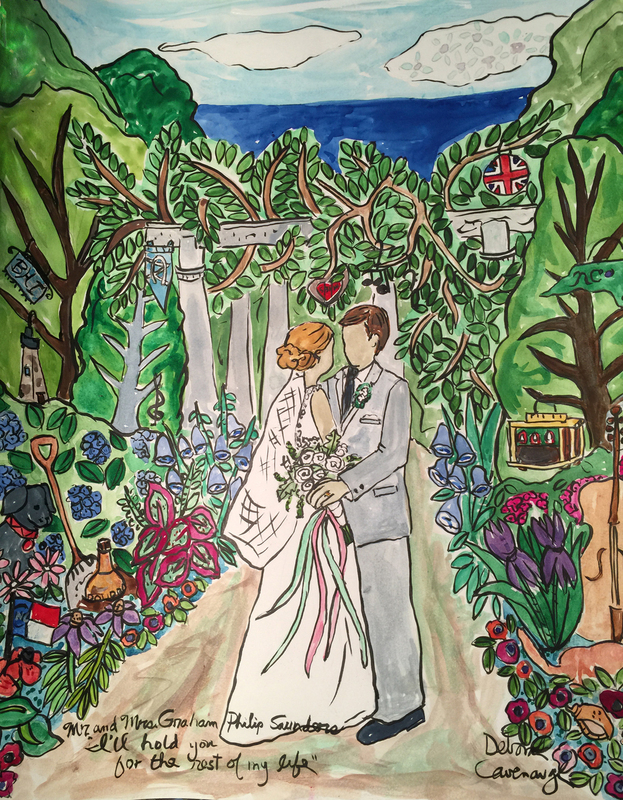 Below you will see a few samples - a Chagallesque painting of the bride and groom (with some of the invitation collaged in) , the wedding party at the chapel, the bride and groom at their families old home place, a map of the honeymoon island.... I can paint whatever you wish. For these more complex paintings, price depends on what you need. Contact Deborah to get your commission going.